Our window cleaning service includes window, frame and screen cleaning. Clean windows are an integral part of any home or business. Business owners take pride in their cleanliness of their storefront windows, knowing that customers often judge the store by how it looks. 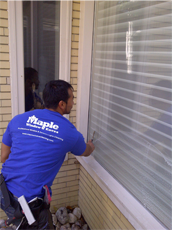 Don’t lose out on customers by having dirty windows; speak to a Maple Window and Eaves Cleaning operative today to ensure that your business has the ultimate look. Maple Window and Eaves Cleaning has experienced staff that can clean and repair your eavestroughs in a timely cost-effective manner ensuring that that your eaves are in proper working condition.